From the author of The Silver Lining Playbook this is an irreverent yet incredibly heartfelt story about a Vietnam vet trying to make amends after waking up from a serious brain surgery. David Granger is a seemingly crusty old, conservative racist who has had one rift too many with his vegan, liberal son. Once you peel the layers, however, and learn about Granger, his actions speak louder than his politically incorrect words. A great study in human nature and the need to know people for who they really are deep down inside. The New York Times bestselling author of The Silver Linings Playbook offers a timely novel featuring his most fascinating character yet, a Vietnam vet embarking on a quixotic crusade to track down his nemesis from the war. After sixty-eight-year-old David Granger crashes his BMW, medical tests reveal a brain tumor that he readily attributes to his wartime Agent Orange exposure. He wakes up from surgery repeating a name no one in his civilian life has ever heard—that of a Native American soldier whom he was once ordered to discipline. David decides to return something precious he long ago stole from the man he now calls Clayton Fire Bear. It may be the only way to find closure in a world increasingly at odds with the one he served to protect. It may also help him to finally recover from his wife’s untimely demise. As David confronts his past to salvage his present, a poignant portrait emerges: that of an opinionated and good-hearted American patriot fighting like hell to stay true to his red, white, and blue heart, even as the country he loves rapidly changes in ways he doesn’t always like or understand. Hanging in the balance are Granger’s distant art-dealing son, Hank; his adoring seven-year-old granddaughter, Ella; and his best friend, Sue, a Vietnamese American who respects David’s fearless sincerity. Through the controversial, wrenching, and wildly honest David Granger, Matthew Quick offers a no-nonsense but ultimately hopeful view of America’s polarized psyche. By turns irascible and hilarious, insightful and inconvenient, David is a complex, wounded, honorable, and loving man. The Reason You’re Alive examines how the secrets and debts we carry from our past define us; it also challenges us to look beyond our own prejudices and search for the good in us all. 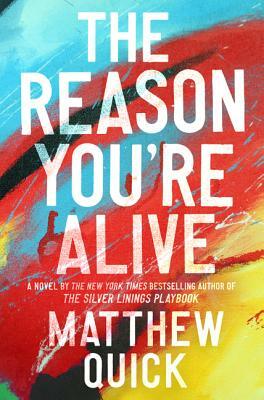 Matthew Quick (aka Q) is the New York Times bestselling author of several novels, including The Silver Linings Playbook, which was made into an Oscar-winning film, and The Good Luck of Right Now. His work has been translated into thirty languages and has received a PEN/Hemingway Award Honorable Mention. Q lives with his wife, the novelist-pianist Alicia Bessette, on North Carolina's Outer Banks.